Are you looking for the perfect outdoor spot to entertain family and friends, connect with nature or just relax and enjoy your surroundings? 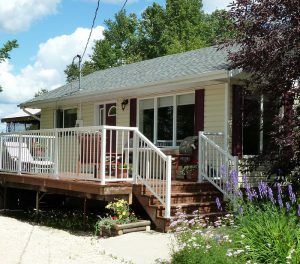 At KAT Reno, our Winnipeg custom deck building services can give you that ideal location right in your own backyard. We have a wide range of durable and versatile options available to suit your needs. Depending on the requirements of your outdoor lifestyle, we have the extensive experience and intuitive knowledge to craft a creative deck solution for you. In addition to more conventional deck styles, we specialize in creating a unique and exceptional outdoor space that blends into the rest of your home, providing an unforgettable destination for yourself and the people in your life. From outdoor barbeque areas to covered decks, KAT Reno has the cutting-edge deck designs to fulfill all of your needs. We also custom build sunrooms and pergolas. Our team of skilled and resourceful professionals are committed to the highest standards of quality craftsmanship. 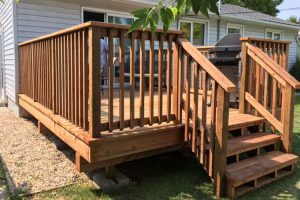 The renovation contractors at KAT Reno take an immense amount of pride in the quality of work that we put into every custom deck that we construct for our clients. 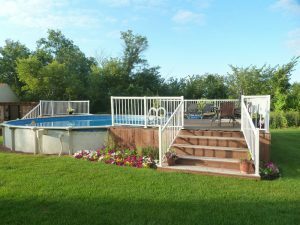 Although we have designed and built a countless number of decks over the years, we approach each project with a fresh vision and enthusiastic determination to produce the outdoor space you have always wanted. To ensure that your new deck creations stand the test of time, we use the highest quality materials in the industry, whether it’s hardwood, softwood, or composite decking. For nearly half a century, we have proudly served the Winnipeg area with reliable and innovative home renovation services. We guarantee complete customer satisfaction on every project. KAT Reno is a Renomark Approved Renovator through the Manitoba Home Builders Assoc., and all of our work comes with a two year warranty. We are also A+ Certified by the BBB, and endorsed by Bryan Bauemler. You only get a few months of summer, so make the most of it with a functional and attractive custom deck from KAT Reno. We love to hear about new projects and how we can help. Fill out our form and let us take the worry out of your next renovation.